Green Careers Spotlight: How Much Can You Make in Electric Vehicle Manufacturing? 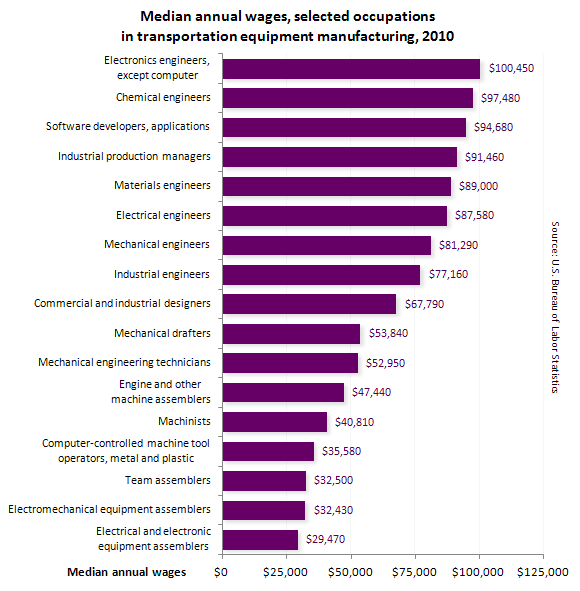 In recent years, the technology and public acceptance for electric vehicles has skyrocketed – leading to the growth of a number of specialized occupations. In their ongoing effort to collect and record data on green jobs and emerging careers in advanced technologies, The Bureau of Labor Statistics has revealed some exciting information concerning job opportunities in electric vehicle manufacturing. Production for vehicles such as the Chevrolet Volt and the Nissan Leaf is just the tip of the iceberg for this industry. Job opportunities in research and development, maintenance, infrastructure development, and sales are slated for significant growth in the coming years. Traditional vehicle manufacturing workers are expected to move into the field of hybrids, plug-in hybrids, and all-electric vehicles as the cars become more widespread.